Artist’s rendering of proposed casino in Brocton. As Brockton prepares for a May 12 referendum on a proposed casino, leaders of neighboring towns are keeping a close eye on the discussions and preparing to assess what impact the gambling resort might have on their communities. “If it passes the ballot, we will be talking with them about the impacts on Easton, and there will be impacts,” said David Colton, Easton town administrator, noting that his town has “been down this road before” when a slot machines parlor was unsuccessfully proposed in 2013 for Raynham Park. 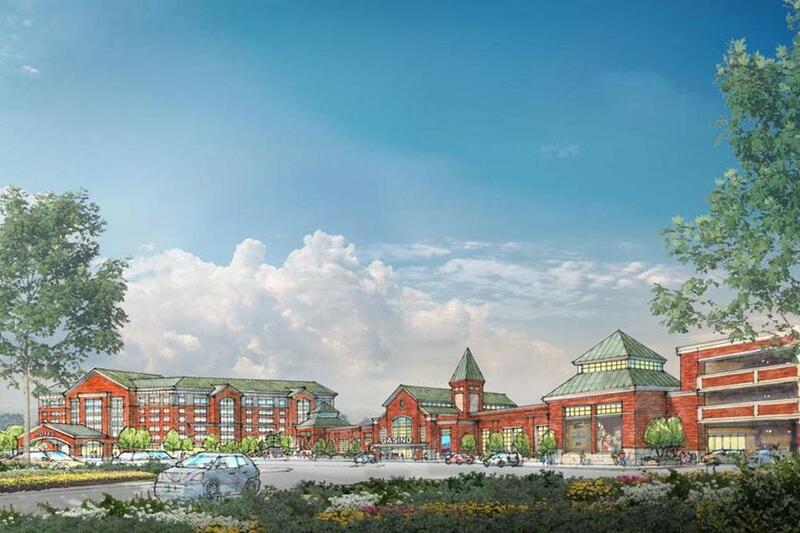 Mass Gaming & Entertainment seeks to locate the $650 million development on the Brockton Fairgrounds, on Route 123. In addition to a gambling facility, it would include a minimum 250-room hotel, stores, and space for events. A partnership between George Carney and Rush Street Gaming, Mass Gaming & Entertainment is one of three groups seeking the single state license for a resort-style casino in Southeastern Massachusetts. Carney owns Raynham Park and the Brockton Fairgrounds. As with the Raynham proposal, Colton said Easton would seek to negotiate a “surrounding community” agreement with the Brockton developers in the event the referendum passes. The state casino law provides for host and surrounding community agreements in which developers offer mitigation for project impact. Brockton has already negotiated a host agreement. Easton’s surrounding community agreement for Raynham Park called for the town to receive $362,500 in annual payments, to be increased annually by 2.5 percent after the fourth year. The developer also pledged to pay for traffic improvements, buy a police cruiser for the town, and make good faith efforts to employ Easton residents, and use Easton businesses. Colton said the Brockton Fairgrounds, as a large, underutilized property, appears to be “appropriate from a siting point of view.” But he noted that traffic already gets congested in that stretch of Route 123 (Belmont Street), “so they are going to have to address that.” He said other potential impacts would also have to be considered. David Gagne, West Bridgewater town administrator, said if Brockton voters approve the plan, his town would also “reach out to the developers” to negotiate a surrounding community agreement, something the town did with the Raynham proposal. Gagne said the project could also bring benefits, citing new jobs and added resources to boost Brockton’s public safety departments — a plus for neighboring communities. In Avon, town administrator Francis T. Crimmins Jr. said officials have not taken up the casino issue but are monitoring the situation. George Samia, town administrator in East Bridgewater, said his town has been preoccupied with its budget problems but will want to become involved in addressing casino impact if the proposal advances beyond the referendum.